August 30th, 2017 | Moving Tips, Packing Tips. Moving out of one home and into another is a complex process that can tax even the sharpest of memories. You may find yourself making endless lists of moving professionals to contact, loose ends to tie up and belongings to take care of as your moving day approaches. But despite your best efforts, things can still fall through the cracks. In this blog, we discuss eight of the items most commonly forgotten when moving. If you’ve ever lost an item after staying in a hotel, you know that the most vulnerable items are the ones you may have to use right up until you leave. You know it’s smart to charge your phone and other personal electronics before you hit the road, but doing so may lead to leaving a cord behind. If possible, charge any electronics the day before you move. Once the batteries are full, pack your cords in personal bags so you can easily check that they’re there before you leave the house. The idea behind the idiom “out of sight, out of mind” often comes into play when items are left behind during a move. It’s easier to remember that you need to grab an item that’s in plain sight than one that’s hidden away in a drawer. Cutlery may also be left behind in the dishwasher, even when a packing service is in charge, because services often don’t handle cleaning in addition to packing. Be sure to check every place you store dishes when packing up your kitchen. Food can pose a particular challenge during a move. Not only do you have to decide what to eat beforehand, what to take with you and what to throw out, you must also consider how you’ll transport any food you do take with you. During the last sweep of your current house, look in every cupboard, refrigerator drawer and pantry shelf. Remember to pack up any stashed-away food like special occasion treats or school lunch snacks that may be kept away from the rest of your food stuffs. Failing to forward mail is fairly common. However, mail left behind in an old box can be more than an inconvenience. Some would-be identity thieves steal mail that’s left unattended to collect personally identifying information. Schedule mail forwarding to begin the day before you move. If you have a trusted neighbor or family member near your old house, consider asking him or her to check for any missed mail once you’re gone. You probably won’t forget your toothpaste and toothbrush because these items tend to stay out on the counter. But what about the bandages, medication and other medical supplies in your medicine cabinets? If you have lots of medical supplies to account for, have each member of your family fill their own box with the medicines that belong to them. This step can prevent you from leaving behind important prescriptions. In addition to individual boxes, schedule a time to collect all shared medical supplies. Anything that you may stash away for a rainy day can be left behind when you move. A surprising number of homeowners inadvertently forget cash, cards, or loose change. Before you really begin packing, take stock of the money in your home. Consider placing any loose bills, credit cards or coins into a safe, transportable container like a handheld safe. In the chaos that ensues before a move, you may need to reference documents that you primarily keep filed away. These documents may include your lease, passport or financial records. Consider creating a file folder, box or page-protecting sleeve for each family member’s documents. Use additional containers for family financial documents, automotive records and other paperwork that doesn’t belong to a single person. These containers allow you to easily check if you have these documents. Strange as it may sound, many individuals forget their pets during a move. This trend includes small animals like ferrets, snakes and hamsters, as well as larger pets. Make a specific plan to care for your pets during the moving process. If you cannot take a pet with you, take the animal to a shelter to reduce the risk of the animal becoming injured or lost. Properly caring for your pets also protects you. You could lose a portion of your security deposit for leaving an animal in your home. In some cases, you could even face a fine if your actions legally constitute animal endangerment or mistreatment. 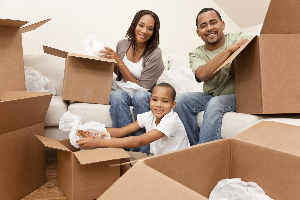 As you prepare for moving day, pay particular attention to these items to ensure that your transition progresses smoothly and with minimal stress. Lost an item during a recent move? In our next blog, we’ll discuss how you can increase the chances of recovering your belongings as soon as possible. If you’re looking for a moving company to help reduce your stress as the big day approaches, contact Wheaton World Wide Moving.